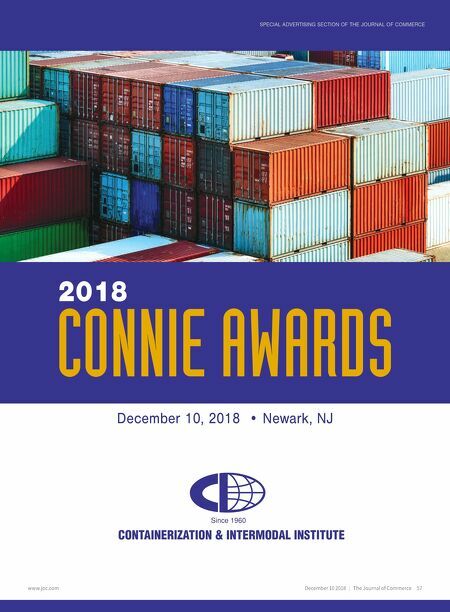 56 The Journal of Commerce | December 10 2018 www.joc.com By Colin Barrett Q&A Q A House of horrors We contracted a home removal company to ship a 40-foot container of personal effects from Namibia to the United Kingdom as part of our transfer of residence back to the UK. The container has arrived at Grangemouth port, but it can't be delivered to us because the ocean carrier needs the original bill of lading before it can release it. The non-vessel-operating common carrier (NVOCC) hired by the home removal company in Namibia has the original bill of lading but won't release it because it hasn't been paid by the home removal company. 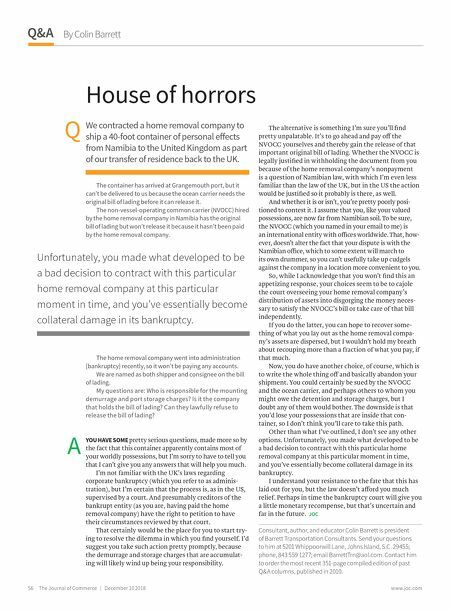 The home removal company went into administration [bankruptcy] recently, so it won't be paying any accounts. We are named as both shipper and consignee on the bill of lading. My questions are: Who is responsible for the mounting demurrage and port storage charges? Is it the company that holds the bill of lading? Can they lawfully refuse to release the bill of lading? YOU HAVE SOME pretty serious questions, made more so by the fact that this container apparently contains most of your worldly possessions, but I'm sorry to have to tell you that I can't give you any answers that will help you much. I'm not familiar with the UK's laws regarding corporate bankruptcy (which you refer to as adminis- tration), but I'm certain that the process is, as in the US, supervised by a court. And presumably creditors of the bankrupt entity (as you are, having paid the home removal company) have the right to petition to have their circumstances reviewed by that court. That certainly would be the place for you to start try- ing to resolve the dilemma in which you find yourself. I'd suggest you take such action pretty promptly, because the demurrage and storage charges that are accumulat- ing will likely wind up being your responsibility. The alternative is something I'm sure you'll find pretty unpalatable. It's to go ahead and pay off the NVOCC yourselves and thereby gain the release of that important original bill of lading. Whether the NVOCC is legally justified in withholding the document from you because of the home removal company's nonpayment is a question of Namibian law, with which I'm even less familiar than the law of the UK, but in the US the action would be justified so it probably is there, as well. And whether it is or isn't, you're pretty poorly posi- tioned to contest it. I assume that you, like your valued possessions, are now far from Namibian soil. To be sure, the NVOCC (which you named in your email to me) is an international entity with offices worldwide. That, how- ever, doesn't alter the fact that your dispute is with the Namibian office, which to some extent will march to its own drummer, so you can't usefully take up cudgels against the company in a location more convenient to you. So, while I acknowledge that you won't find this an appetizing response, your choices seem to be to cajole the court overseeing your home removal company's distribution of assets into disgorging the money neces- sary to satisfy the NVOCC's bill or take care of that bill independently. If you do the latter, you can hope to recover some- thing of what you lay out as the home removal compa- ny's assets are dispersed, but I wouldn't hold my breath about recouping more than a fraction of what you pay, if that much. Now, you do have another choice, of course, which is to write the whole thing off and basically abandon your shipment. You could certainly be sued by the NVOCC and the ocean carrier, and perhaps others to whom you might owe the detention and storage charges, but I doubt any of them would bother. The downside is that you'd lose your possessions that are inside that con- tainer, so I don't think you'll care to take this path. Other than what I've outlined, I don't see any other options. Unfortunately, you made what developed to be a bad decision to contract with this particular home removal company at this particular moment in time, and you've essentially become collateral damage in its bankruptcy. I understand your resistance to the fate that this has laid out for you, but the law doesn't afford you much relief. Perhaps in time the bankruptcy court will give you a little monetary recompense, but that's uncertain and far in the future. JOC Consultant, author, and educator Colin Barrett is president of Barrett Transportation Consultants. Send your questions to him at 5201 Whippoorwill Lane, Johns Island, S.C. 29455; phone, 843 559 1277; email BarrettTrn@aol.com. Contact him to order the most recent 351-page compiled edition of past Q&A columns, published in 2010. Unfortunately, you made what developed to be a bad decision to contract with this particular home removal company at this particular moment in time, and you've essentially become collateral damage in its bankruptcy.